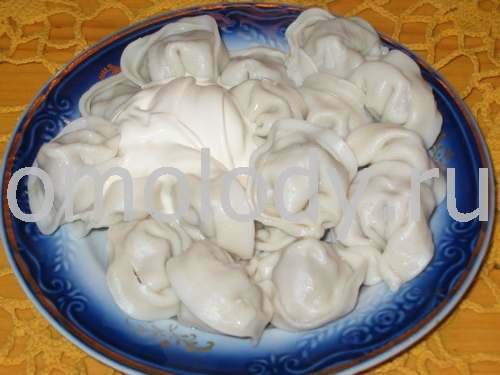 Siberian Pelmeni with meat or cabbage. Recipes from Russia. Siberian Pelmeni with meat or cabbage. Yield: 1 kg pelmeni or four portions. 200 g (7 oz) beef, fillet, minced. 250 g (8,8 oz) pork, fillet, minced. crushed garlic, salt, ground black pepper, ground dry herbs, such as green onions, thyme, dill, parsley, Celery - to taste. 350 g (12,3 oz) pork, fillet, minced. 180 g ( 6,4) cabbage, finely chopped or shredded, stewed. Sift the flour on to the dough board, make a hollow in the centre of the flour, add egg, water and salt. Knead into a heavy dough, cover and set aside for half an hour. Roll the dough thin and cut into 5-6 cm (2 - 2.5 inch) rounds. Put a ball of filling (about the size of a small walnut) on one half of the round and fold over making a half moon. Pinch the edges, draw the two points together making a little purse. Repeat with the remaining filling and dough. Put the pelmeni in 4 liters (8 pint) boiling water, add 1 tbsp salt. Continue to boil until the pelmeni rise to the surface. Remove with a skimmer. 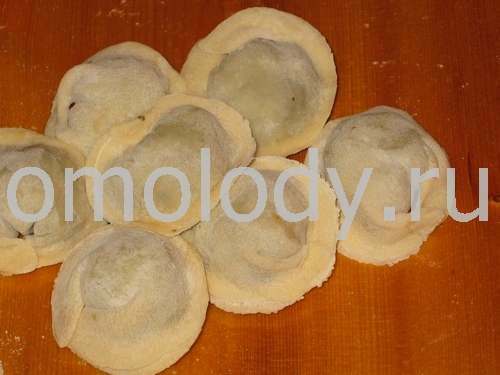 These pelmeni are made in the eastern areas of Russia. They are shaped as usual or in the form of a "knot". Serve with butter, butter and vinegar, sour cream or green onions.